INTEGRATED’s software programs are leading simulation tools to design Actuators. Our Actuator design software programs provides innovative proprietary Boundary Element Method (BEM) technology for the most accurate numerical field solutions to simulate the Actuators. Finite Element Method (FEM) analysis solver is also incorporated in programs to provide additional benefit. Electrostatics calculations: Equivalent circuit parameters, electric field strength and voltage distribution, calculation of the capacitance matrix. Magnetostatics calculations: Magnetic field and flux distribution inside actuator, inductances, magnetic forces and/or torques. Transient Analysis calculations: Transient sources can be surface or volume currents, impressed magnetic/electric fields, and voltage, temperature or power sources. Thermal analysis: Temperature distribution at all points within a model. 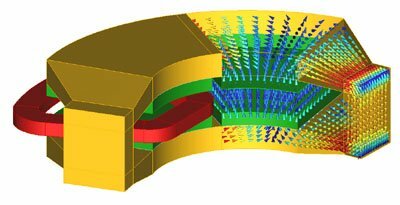 For brushless DC motor simulation it is usually sufficient to conduct a two dimensional (2D) analysis with MAGNETO. If it is necessary to include the effects of flux leakage at the ends of the motor, then three dimensional (3D) program AMPERES should be used. For induction motor simulation it is usually sufficient to conduct a 2D analysis with OERSTED. If it is necessary to include the effects of flux leakage at the ends of the motor, then FARADAY should be used. Solenoids are typically DC magnetic fields and rotational symmetric geometry, and are thus well suited to MAGNETO for magnetic analysis. For cases with significant non-rotational symmetric effects, AMPERES should be used instead. If there are significant transient effects (e.g. due to motion of the plunger), then the programs to use are OERSTED (2D) and FARADAY (3D). To model electric problems (e.g. potential for breakdown around the coils), then the programs to use are ELECTRO (2D) and COULOMB (3D). To model thermal problems (e.g. finding hot spots), then the programs to use are KELVIN (2D/RS) and CELSIUS (3D). AMPERES is recommended, as the configuration of the permanent magnets requires a full 3D analysis. Conventional dynamic cone loudspeakers can usually be analyzed using a MAGNETO RS model. More exotic shapes may require AMPERES, and loudspeakers employing electrostatic forces may require ELECTRO or COULOMB. The Boundary Element Method has a particular advantage for this application because of its ability to generate extremely accurate air gap field analysis.